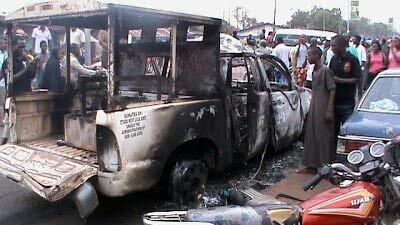 The robbers, numbering about 50, stormed Auchi, Edo State, in a bus and three Camry cars loaded with dynamites and bombs. They unleashed mayhem on three new generation banks and one old generation bank. As it seemed, the robbers were familiar with Auchi, buttressing the argument by many that they may have been in town for about two weeks plotting this attack. They started the attack around 6:30 pm when security operatives were either praying in the mosques or handing over to those on night shift. They caught the security operatives in the town by surprise. The Army School of Electrical Engineering is located in Auchi. The robbers immediately stormed the areas they suspected were houses of the army personnel where three soldiers were shot dead. The robbers then organized themselves into groups and were operating simultaneously in their targeted areas. As they shot sporadically in areas suspected to house military men, they bombed the police Area Command office and the Auchi divisional police headquarters. Then they unleashed mayhem on the three banks located along Poly Road and one at Igbe Road. They used dynamites to blow up the ATM machines and the bank buildings in their efforts to loot the banks. While the operations were on, some of the gang members shot ceaselessly. About fifteen persons fell to the bullets including soldiers. The robbers operated for close to three hours without resistance from security agencies. Auchi was under siege for those hours while residents ran to their homes, calling relatives and friends in Benin City that Boko Haram members may have invaded the town. It was learnt that the bandits could not gain access into the vaults of three banks, but were able to gain entrance into one because the staff were still at work. About N3.5million was said to have been carted away from that particular bank. At about 11p.m. on Monday, the Acting Commissioner of Police in the state, Hurdi Muhammad, left Benin City for Auchi where he found that his men were now homeless as the Area Command office and the divisional police headquarters were razed. Several patrol vehicles, Armoured Personnel Carriers (APC) within the Area Command and Auchi divisional office were torched. As a matter of fact, it would have been difficult for the police to chase the robbers because their first move was to set ablaze most of the patrol vehicles parked at the Area Command office. It was, however, said that the robbers were infuriated when the police fired at them, consequently upon which they went back to bomb the Area Command forcing the policemen to take to their heels. The state has been calm since Muhammad was made Acting CP; the Auchi attack was his first baptism of fire. The Edo Deputy Governor, Dr Pius Odubu, led a delegation comprising of the heads of security agencies in the state to Auchi on Tuesday morning. Embattled Muhammad, who slept in Auchi, joined the delegation to the palace of the Otaru of Auchi, Alhaji Alhaji Aliru Momoh. Odubu was shocked, particularly when he was informed that several dead bodies were deposited at the Auchi Central Hospital mortuary. The entire town was thrown into mourning. While speaking at the palace of the Otaru, the Deputy Governor expressed grief over the incident and stressed the need for the Federal Government to equip the police with sophisticated weapons in order to face challenges such as this. Following the attack,soldiers have been stationed at strategic points in Auchi, but there is no much presence of police officers. The policemen in the area now wear mufti for fear of being attacked. The situation is even worse for the police in the area because they no longer have offices to operate from. They now stay under cashew trees. All the banks in Auchi and several shops remained closed late last week, while soldiers were seen at Jattu junction and strategic areas in the town. Economic activities in the area were at the lowest ebb as residents travel to Ekpoma in Edo Central senatorial district for banking transactions due to the refusal of the Bankers Forum in Auchi to resume operations as a result of what they described as lack of adequate security in the town. The chairman of the Bankers Forum, Auchi branch, Mr Bash Sanusi, who disclosed the resolve of banks in the area not to open to customers, attributed their travail to the inefficiency of the police and other security agencies in Auchi. The security situation in Edo took a dive when some bandits invaded Benin City, the state capital, on Wednesday night, killing a Mobile Police officer and a four-year-old child. The gunmen took over Akpakpava Road at about 7 pm, shot sporadically along the road, and, in the process, abducted a popular estate valuer, Chief Dan Odiete. It was in that melee that a stray bullet killed the four year old girl who was in the car with her mother. The Mobile Police officer was shot by the robbers when he was sighted. The people of the state are worried that even after seventeen lives had been wasted in two days, nobody has been arrested giving the impression that the police and other security agencies have either been overwhelmed or they are helpless.